BRUSSELS, April 9 (Xinhua) -- China and the European Union (EU) on Tuesday reiterated their shared commitment to further cementing their partnership and safeguarding free trade and multilateralism. 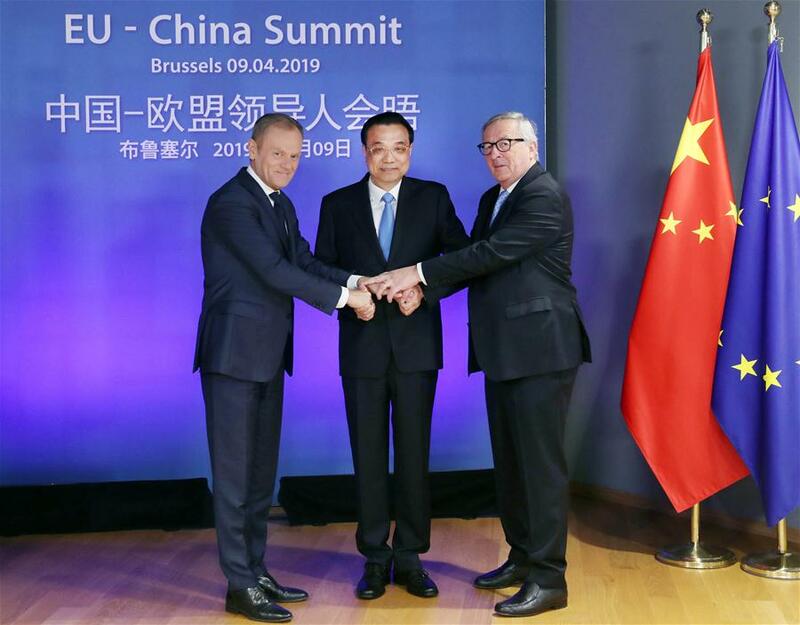 The reaffirmation was made in a joint statement issued after the 21st China-EU leaders' meeting in Brussels, which was co-chaired by visiting Chinese Premier Li Keqiang, President of the European Council Donald Tusk and President of the European Commission Jean-Claude Juncker. During the leaders' meeting, both sides reaffirmed their commitment to deepening the China-EU comprehensive strategic partnership for peace, growth, reform and civilization based on the principles of mutual respect, trust, equality and mutual benefit, by comprehensively implementing the China-EU 2020 Strategic Agenda for Cooperation. China and the EU commit to achieve in the course of 2019 the decisive progress required, notably with regard to the liberalization commitments, for the conclusion of an ambitious China-EU Comprehensive Investment Agreement in 2020, said the joint statement. The high level of ambition, it added, will be reflected in substantially improved market access, the elimination of discriminatory requirements and practices affecting foreign investors, the establishment of a balanced investment protection framework and the inclusion of provisions on investment and sustainable development. "China is ready to work with Europe to promote two-way opening-up and provide a level playing field for our companies to strengthen cooperation in each other's countries," said the premier in a signed article published Monday as he kicked off the ongoing visit to the continent. According to official statistics, the EU has been China's top trading partner for 15 years in a row, while China has been the EU's second largest trading partner for years running. Two-way trade hit a new record of 682.16 billion U.S. dollars in 2018. In June, China will further shorten its negative list for foreign investment, adopt the principle of deeming areas that are not on the list as fully open, and continue to improve its business environment, Li said at a joint press conference with Tusk and Juncker after their meeting. While meeting with Belgian Prime Minister Charles Michel earlier in the day, the Chinese premier said China is willing to expand imports from Belgium of high value-added products that meet the demand of the Chinese market. "China's recent focus on increasing imports has further encouraged European nations and businesses to seek long-term trading connections and arrangements with China," Cambridge University professor Alan Barrell told Xinhua Tuesday in an interview. "We should be hopeful that strong and warm trade winds can now blow east to west and west to east, and give power to all those working to build a better world for all by developing trade and cultural links," he said. At their joint press conference, the Chinese and EU leaders agreed that as two major forces for preserving world peace, prosperity and development, China and the EU should cooperate to broaden common interests, so as to bring benefits to the people on both sides. It is a win-win outcome that the two sides have reached consensus on the joint statement through in-depth communication and discussion based on mutual respect, equality and consultation, they said. The achievement, they added, has demonstrated the maturity and high level of the comprehensive strategic partnership between China and the EU, charted the course for their cooperation in the next stage, and injected new impetus to the development of bilateral ties. The Chinese premier said the two sides have far more common interests than differences, and the expansion of common interests will help further reduce their differences. Hailing this meeting as a fruitful one, Li said important consensus has been reached on deepening the China-EU partnership, upholding multilateralism and free trade, intensifying cooperation on science, technology and innovation, advancing negotiations on the bilateral investment agreement and the geographical indications agreement, expanding two-way market access, and strengthening connectivity, among other issues. The joint statement is not only a manifestation of attitude, but also a clarification of direction, Li stressed, adding that China and the EU will strive for solid progress in practical cooperation so as to achieve more tangible outcomes and bring more benefits to the people on both sides. In the joint statement, the two sides reaffirmed their commitment to multilateralism and opposition to protectionism, and reiterated their respect for international law and for fundamental norms governing international relations, with the United Nations (UN) at the core. They also vowed to uphold the UN Charter and international law, and all three pillars of the UN system, namely, peace and security, development and human rights. China and the EU firmly support the rules-based multilateral trading system with the World Trade Organization (WTO) at its core, fight against unilateralism and protectionism, and commit to complying with WTO rules, said the joint statement. Speaking at the press conference, Tusk and Juncker said the EU-China partnership now bears unprecedented significance given the current complicated international situation. The two sides should work together to meet the challenges and contribute to building a more peaceful and prosperous world, they added. They called for joint efforts to implement the consensuses reached at the leaders' meeting, increase coordination on international affairs, intensify contact and cooperation on such issues as WTO reform, and deepen the EU-China comprehensive strategic partnership. The European side, they said, is confident in the Chinese side, and in the EU-China partnership. Later Tuesday, the Chinese premier continued his five-day Europe trip and traveled to Croatia for an official visit and the eighth leaders' meeting of China and Central and Eastern European countries.